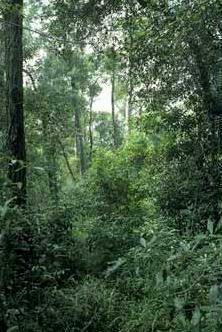 Sydney Turpentine Ironbark Forest (STIF). Most of the sites IWEG is revegetating would originally have been Sydney Turpentine Ironbark Forest, which is listed as critically endangered by the Federal Government under the Environment Protection and Biodiversity Conservation Act. In nature, the distinction between vegetation communities becomes blurred where two or more meet and overlap. At these transition points, a patch of bush may contain species from two usually distinct communities. We have replicated this complexity by planting at some of our sites a few species of the sandstone and clay plain communities. STIF originally extended over 26,000 hectares west to Guildford, and north of Parramatta River from Ryde to Castle Hill. It also occurs on the shale ridge caps in the Hornsby Plateau. Now less than 5 per cent of the original forests remain, mostly as small remnants in the Baulkham Hills, Parramatta and Bankstown areas. As the name suggests, these forests are dominated by Turpentines and Ironbarks that form the canopy, with an understorey of grasses – Kangaroo Grass (Themeda australis), Wallaby Grass (Danthonia tenuior), Three-awned Speargrass (Aristida vagans) and Blady Grass (Imperata cylindrica). There would also have been Blackthorn (Bursaria spinosa), the orange flowered pea Daviesia ulicifolia and the pink-flowered peaIndigofera australis, among many other plants. Sydney Turpentine Ironbark Forests were dominated by majestic Turpentines (Syncapria glomulifera), which grow to a height of 60m and may live 500 years. The trunk of a mature tree trunk can soar to 45m before branching and may measure 1.5m in diameter at its base. The thick brown bark is fibrous, with deep vertical furrows, and the leaves have distinctive grey hairs on the underside. It is not a eucalypt, so the seed pods it produces are very distinctive. Its flowers are creamy white and make a great display from September to November. If you want to see some good examples, there are some old specimens at Yeo Park, Ashfield, and at Queen Elizabeth Park, Concord. The Turpentine timber resists fire and is very durable in salt water so it was often used as piles in wharves. Les Robinson, author of Field Guide to the Native Plants of Sydney, says the docks in London were made of Australian Turpentine. The trees are pollinated by native and European bees, moths and flies, and the flowerrs are food for Grey-headed Flying Foxes. Ironbark is the common name used for several eucalypt species. Those that grew in the STIF included Broad-leaved Ironbark (Eucalyptus fibrosa) and Grey Ironbark (Eucalyptus paniculata). Broadleaved Ironbarks grow to 35m and their branches spread about 10m. The trunk has deeply furrowed dark gray bark, and the leaves are dark grey-green and broader than other ironbarks’. The flowers are creamy white, and the dense, strong wood was valued for lumber. The sap, locally called kino, was used by the Cadigal and Wangal peoples to keep fishing lines from fraying, and also by the early settlers for ink. These trees flower from November to January. Torrangora, the Aboriginal name in the Sydney region for this tree, grows to between 20m and 30m tall. Its timber was prized for its durability and was used for railway sleepers and bridges. It flowers from autumn to spring. There are very few remnants left of the original Sydney Turpentine-Ironbark Forest – often just isolated trees that have somehow escaped the axe. According to the authors of Missing Jigsaw Pieces: The Bushland Plants of the Cooks River Valley, there are some patches at Wiley Park, Birrong and Strathfield. They reported in 1999 there was a large Turpentine on private property on The Parade, Dulwich Hill, and some other specimens beside the railway line near Hurlstone Park train station and inside the grounds of the Maronite School at Wardell Rd, Marrickville. The Greenway Revegetation and Bushcare Plan (2011) found there was a small area of remnant vegetation about 100m north of New Canterbury Rd, Dulwich Hill, on the western side of the corridor on very steep, very poor soils upon which was growing specimens of Sickle Wattle (Acacia falcata), Sydney Green Wattle (Acacia parramattensis), Sweet Pittosporum (Pittosporum undulatum) and Kangaroo Grass (Themeda australis) that were probably self-sown remnants of the original vegetation.